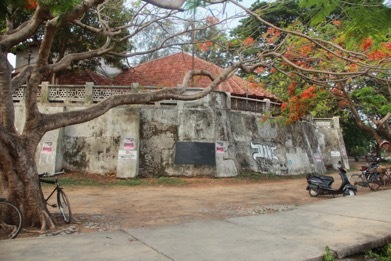 Built in 1667, the Bastion Bungalow on River Road is an Indo-European building and the only remaining structure of the once extensive Dutch fortifications. 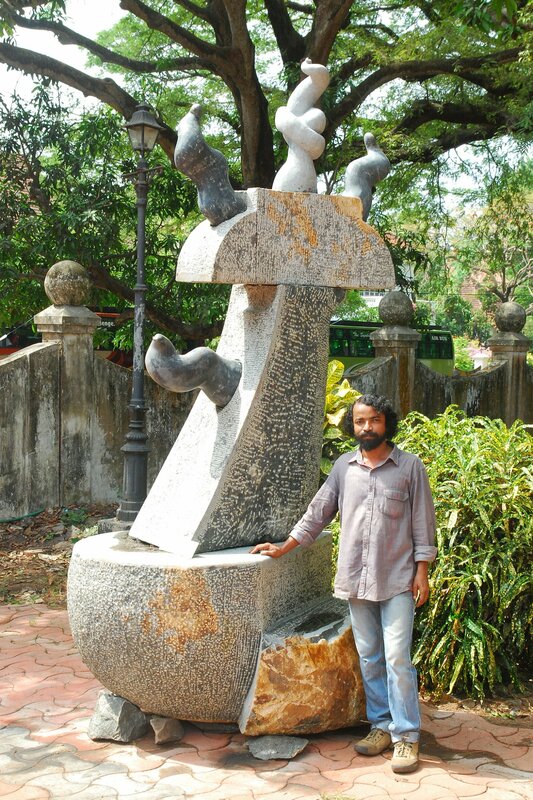 Local artist Hochimin created this abstract sculpture in Kochi to tell the untold histories of African slaves in colonial Cochin. 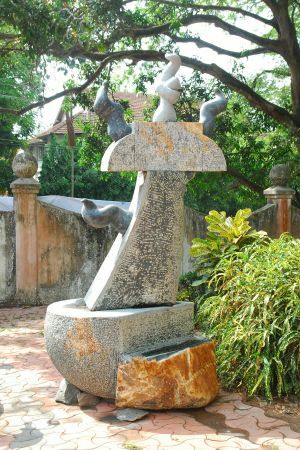 This public sculpture that represents the histories of the struggles of Africans in the Portuguese and Dutch occupied Kochi (Cochin) is displayed at the Bastion Bungalow Museum at Fort Kochi. 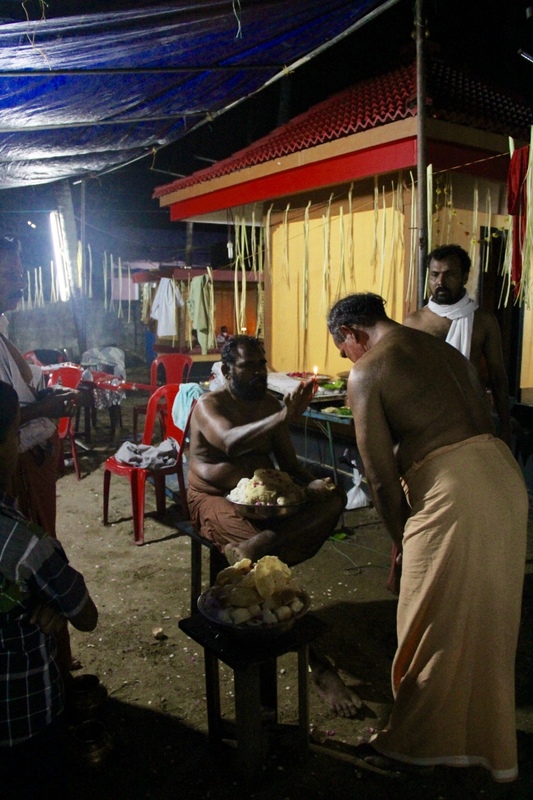 Food offerings such as rice cakes being given to the spirit medium who had invoked Kappiri into his body. 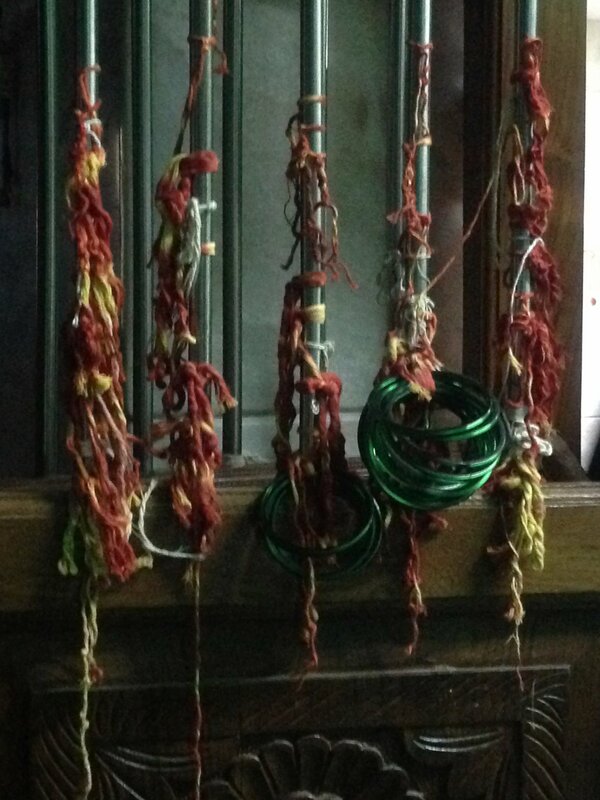 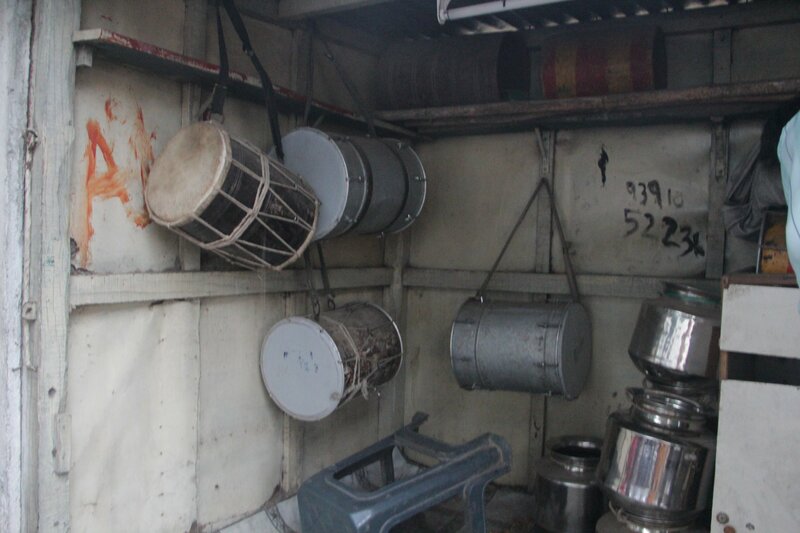 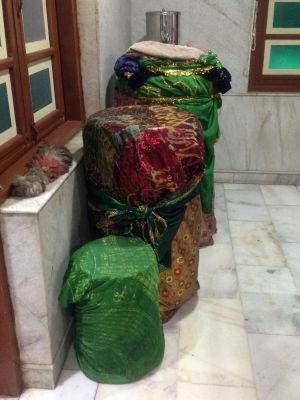 Three-legged drums covered with scared cloth at the dargah of Kamli Shah in Kurla, Mumbai. The drums are played during the special prayers on Thursday and on the urs. 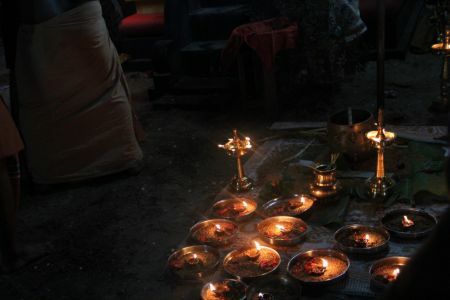 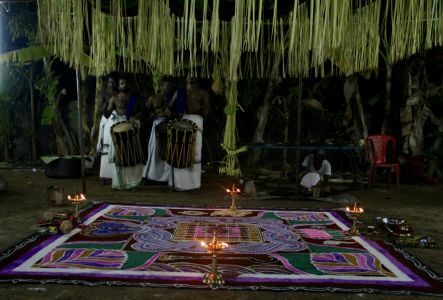 At the chilla of Gaiban Shah Baba most of the rituals are offered according the Siddi worship tradition . 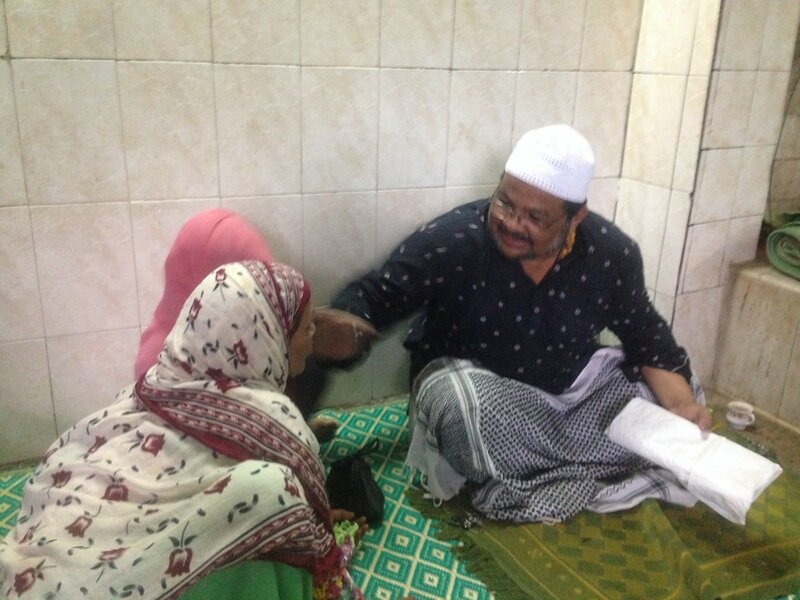 Local non-Siddi Muslim devotees visit the chilla to get the blessings of the saint and to also consult with the Siddi muzawar Nazir Bai. 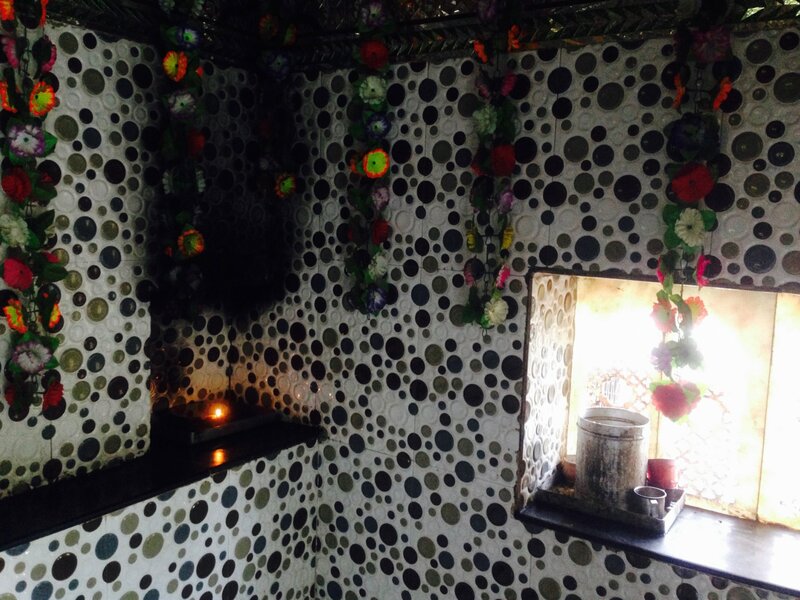 The mazar of the Siddi Sufi saint Kamli Shah who is believed to have performed miracles and who has the ability to interceded in the live of his devotees and solve their afflictions. 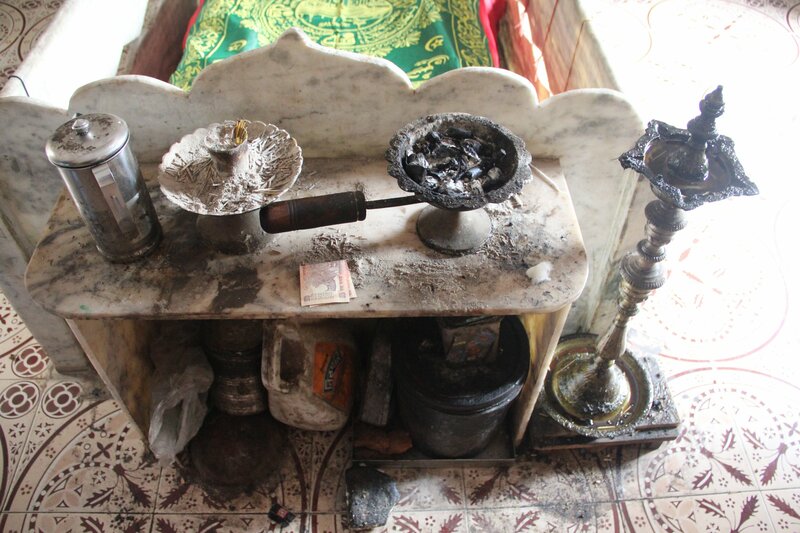 The caretaker of the mazar is Amina, a Siddi woman. 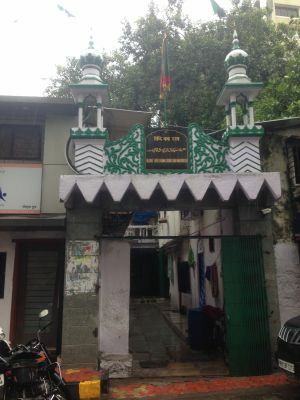 The shrine dedicated to Kamli Shah in Dadar Mumbai is maintained by a Sidi family. 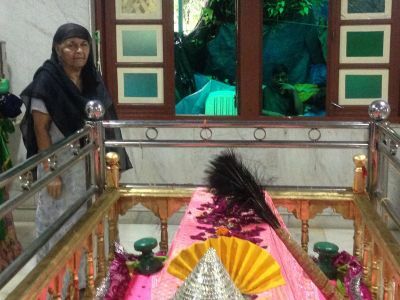 Kamli Shah is a Siddi Sufi Saint who is believed to have come to Bombay from Maghreb, which mostly encompasses the west North Africa. 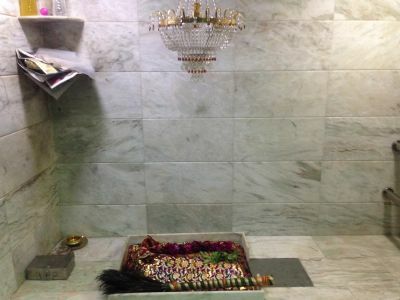 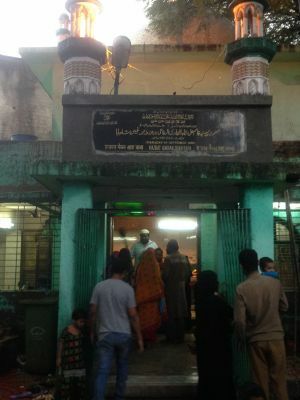 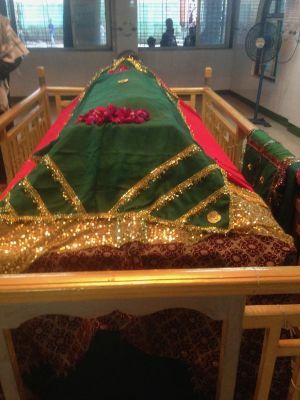 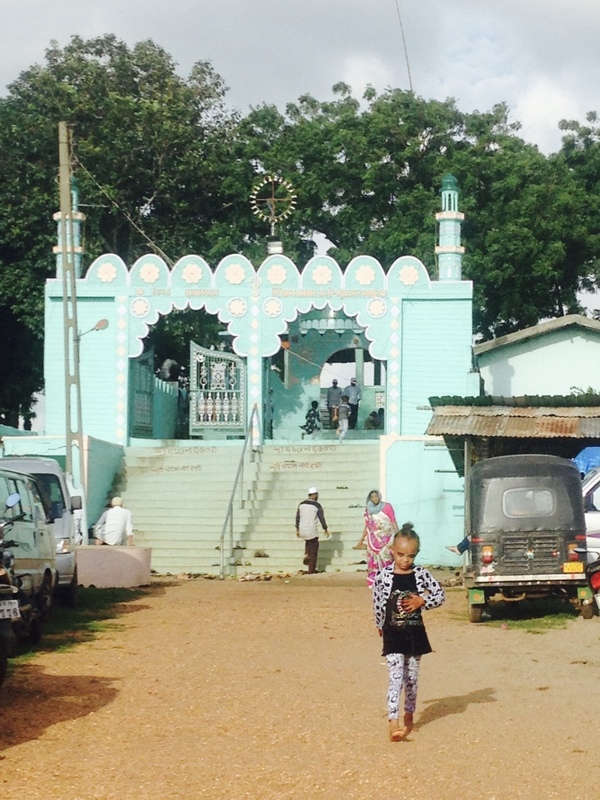 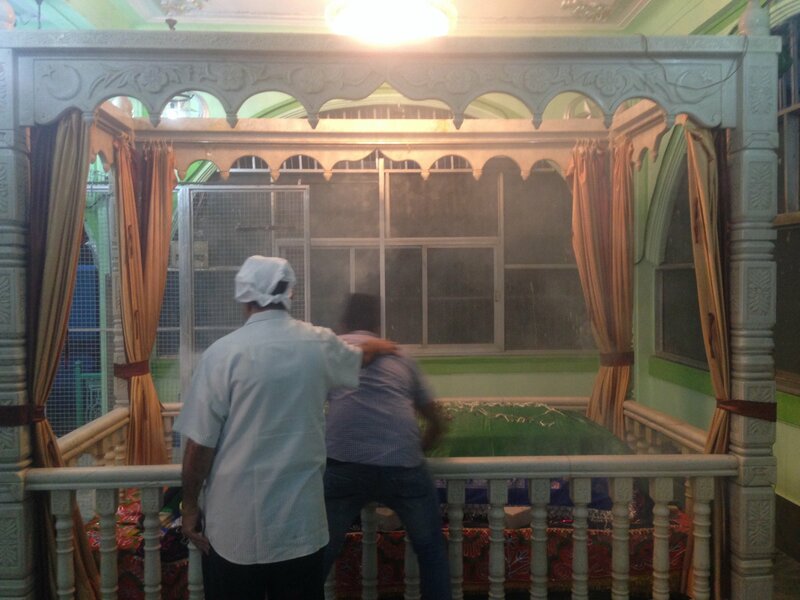 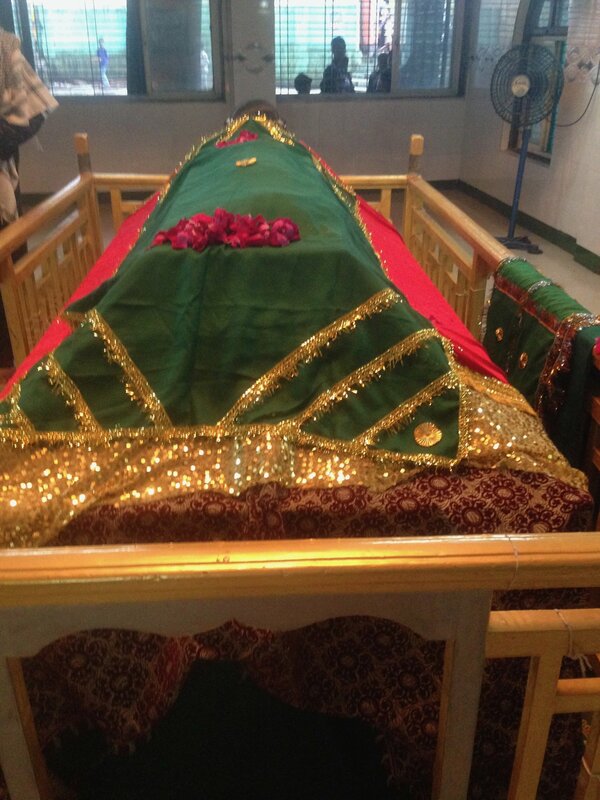 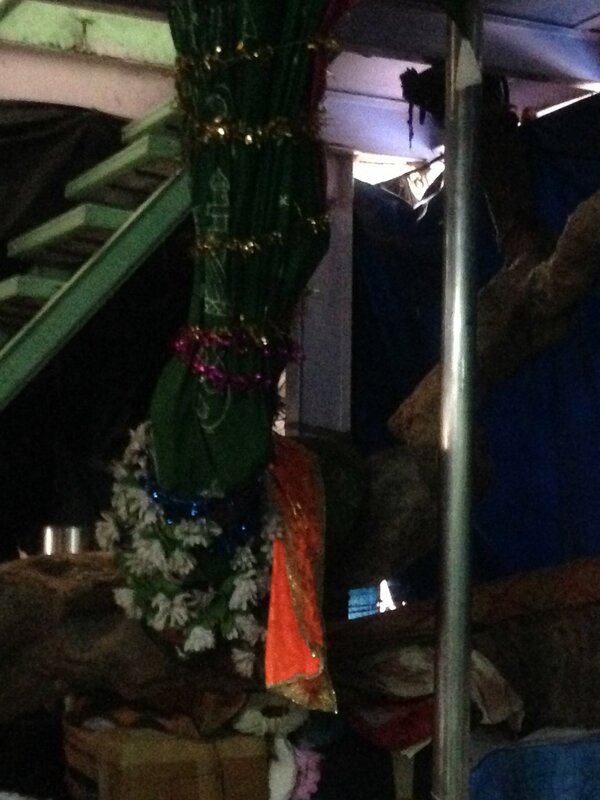 The shrine dedicated to Hazrat Gaiban Shah Pir who is a Sufi saint is managed by a local Siddi family in Kurla. Seen here is the entrance of the shrine thronged by devotees. 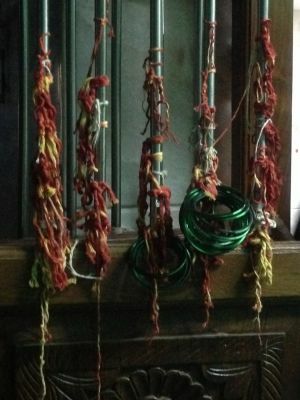 Instruments used in the African marfa performance. 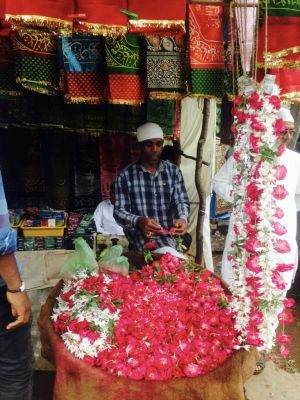 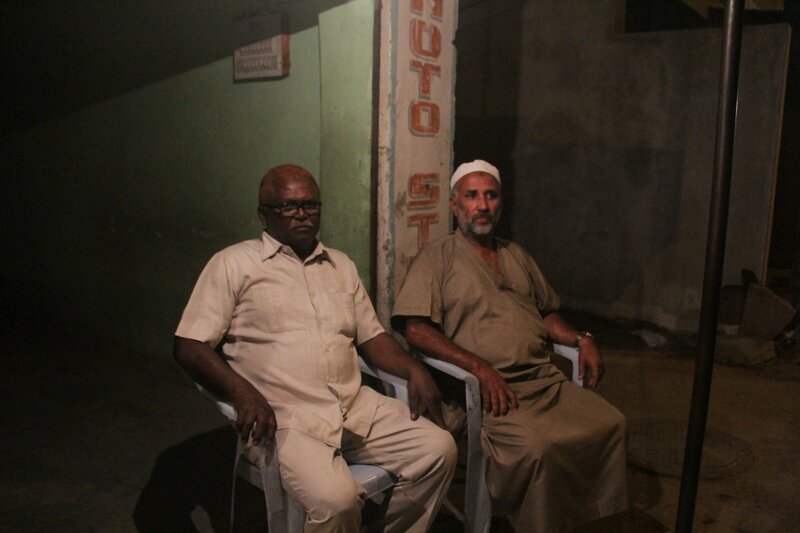 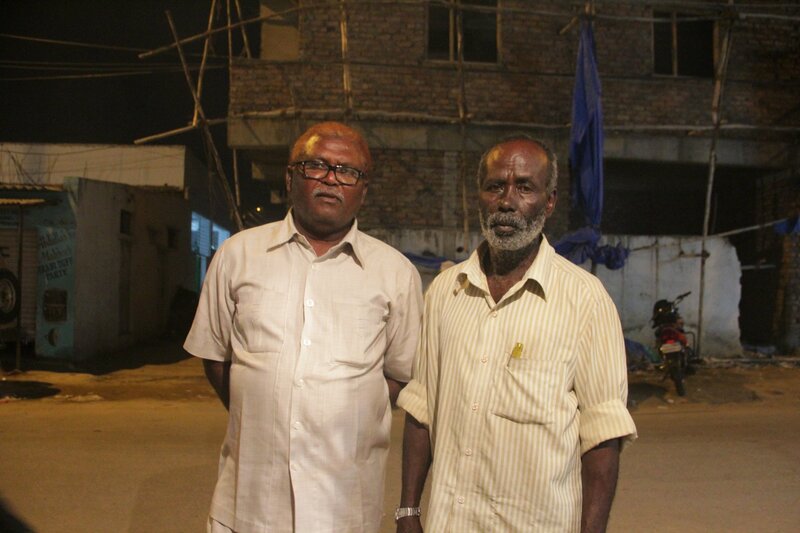 Both the Sidi and the Chaush who are Yemeni descent communities in Hyderabad perform the marfa. 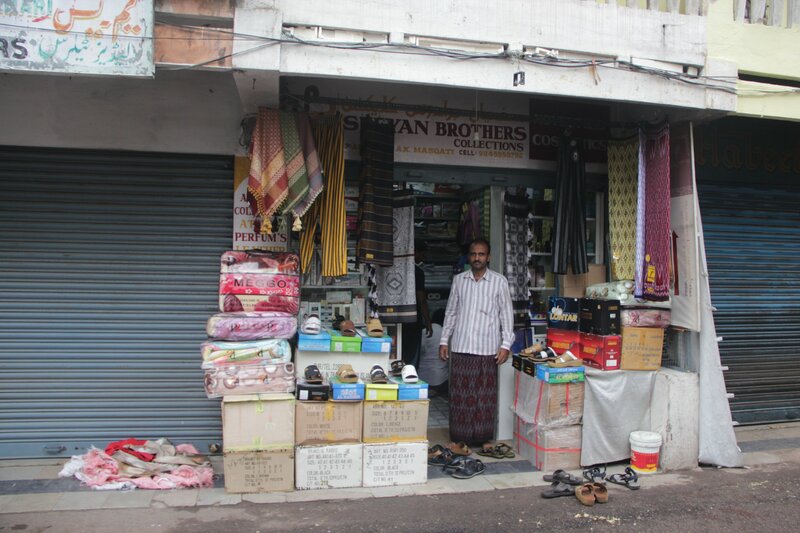 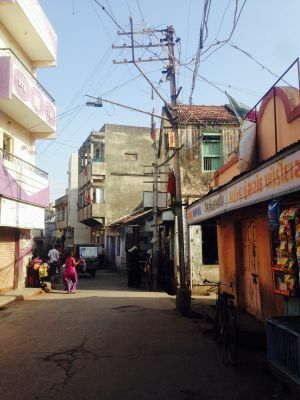 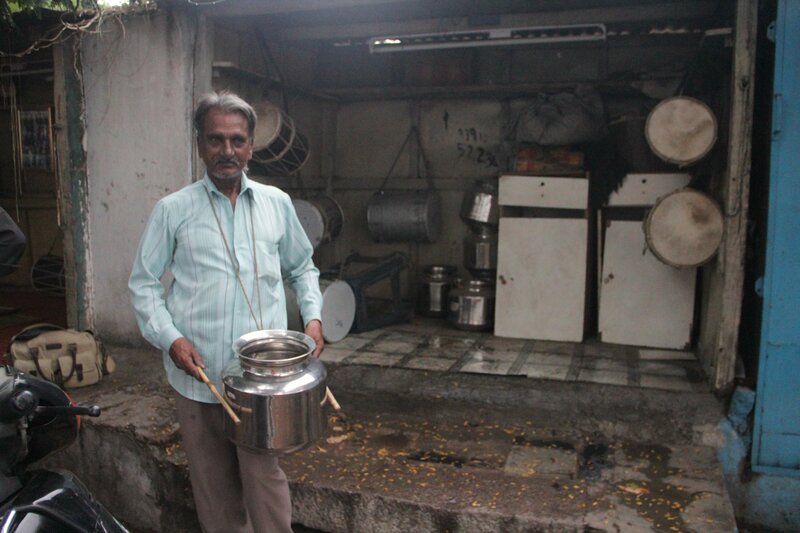 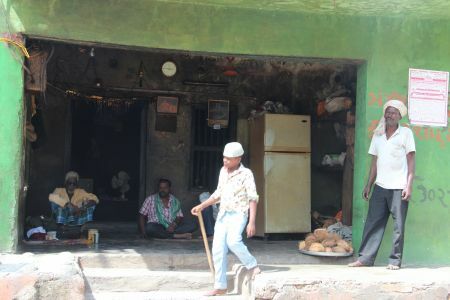 A general store in Barkas, a suburban locality in Hyderabad that is the home of the Hadhrami community. 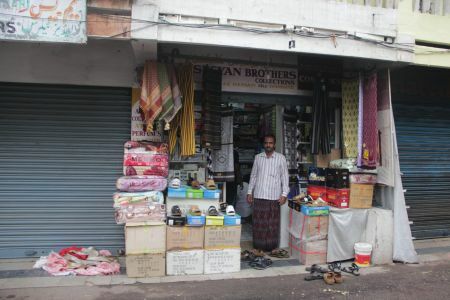 The store various sells food, textiles, and other commodities from the Arab world. 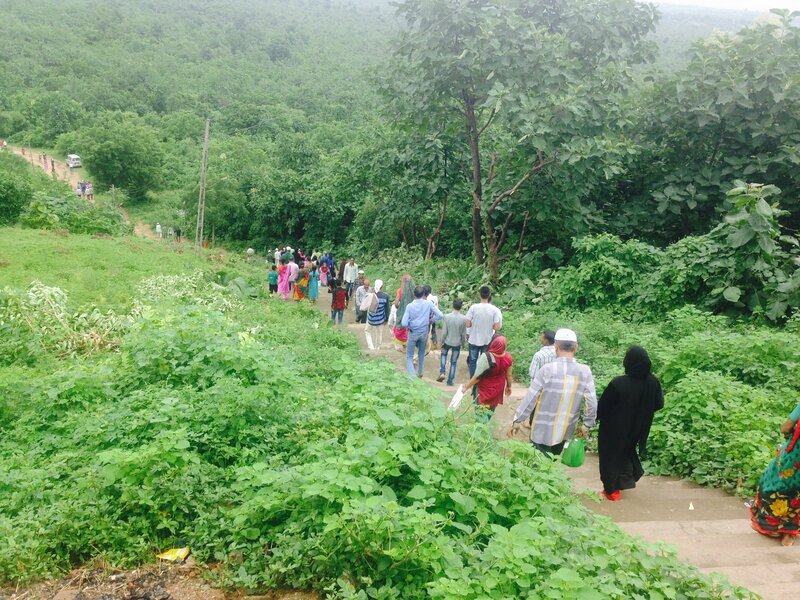 Devotees leaving after offering their prayers to Khapri. 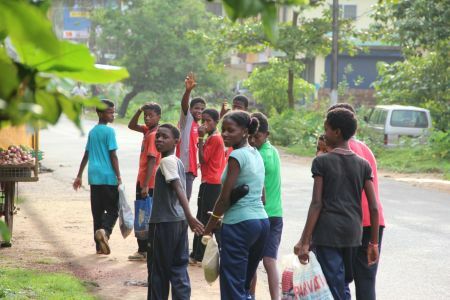 Young sidi students of the Karnataka state athletic hostel heading for their evening sports practice. 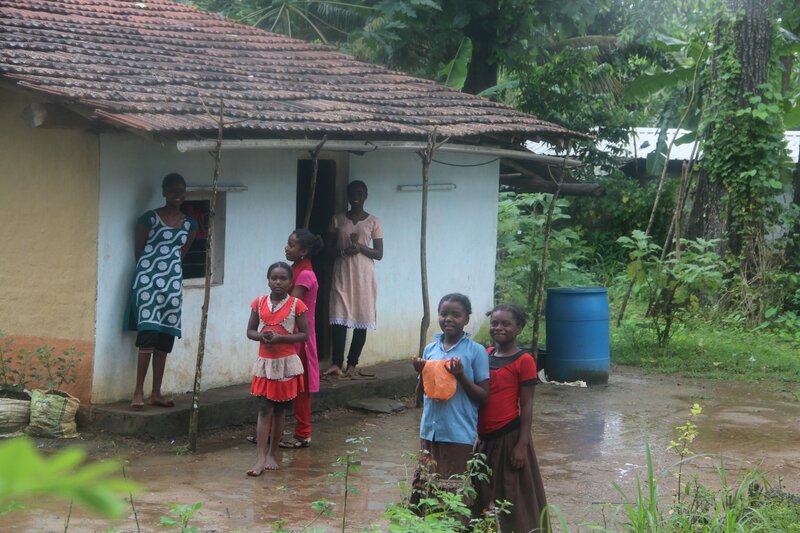 Seen here are women from the Sidi community in Karwar. 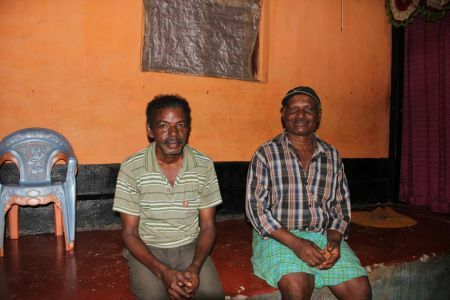 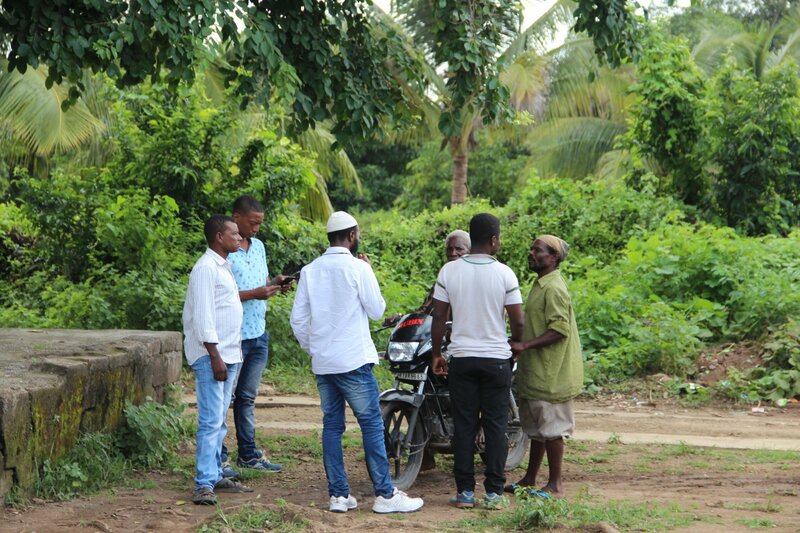 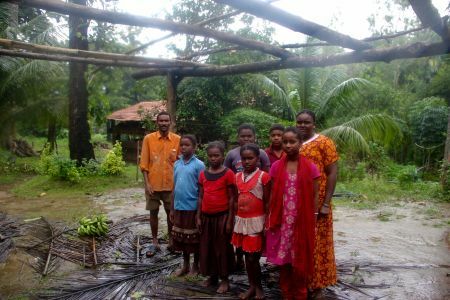 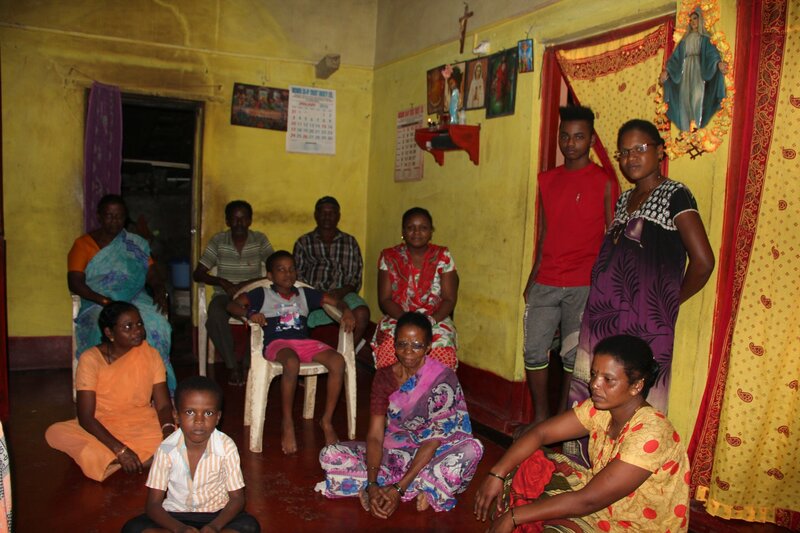 There are few Sidi families living in Karwar and these are Sidis who had moved from small villages of Karnataka to find better job options. Young Sidi children in the villages of Karnataka help their family with the household chores after returning from their schools. 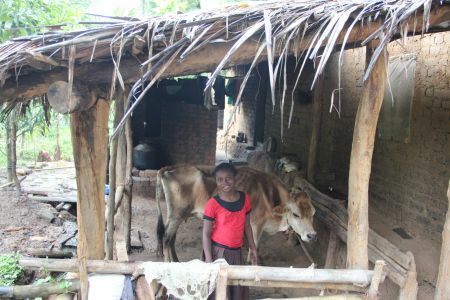 Seen here is a young girl taking care of her cow. 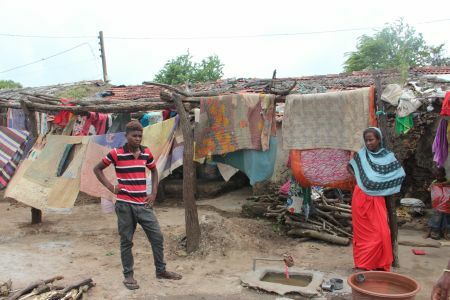 A Sidi family in a village near Manchikeri. 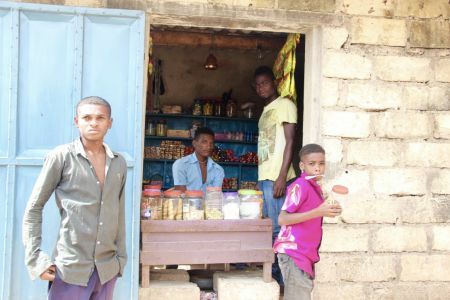 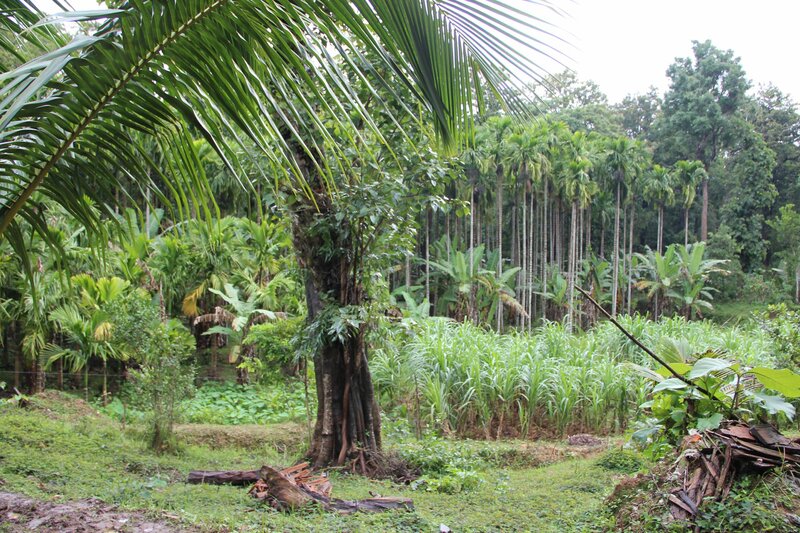 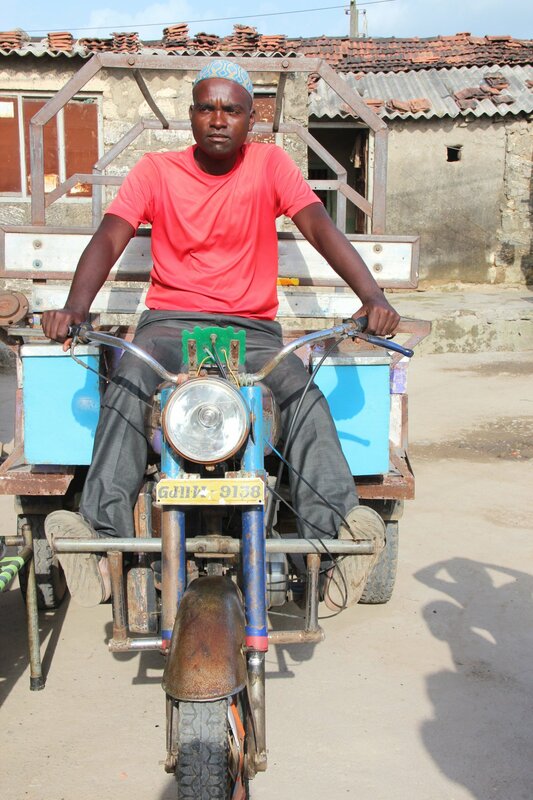 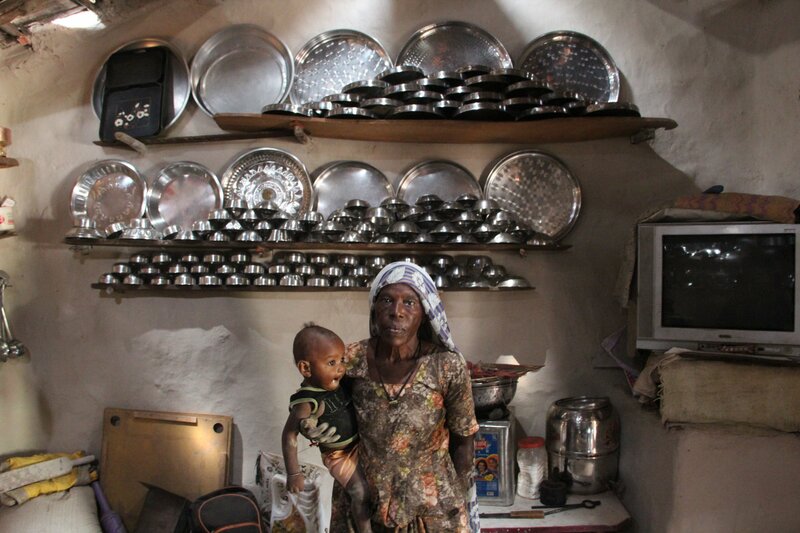 Most of the sidi families cultivate the forest land to earn a living. 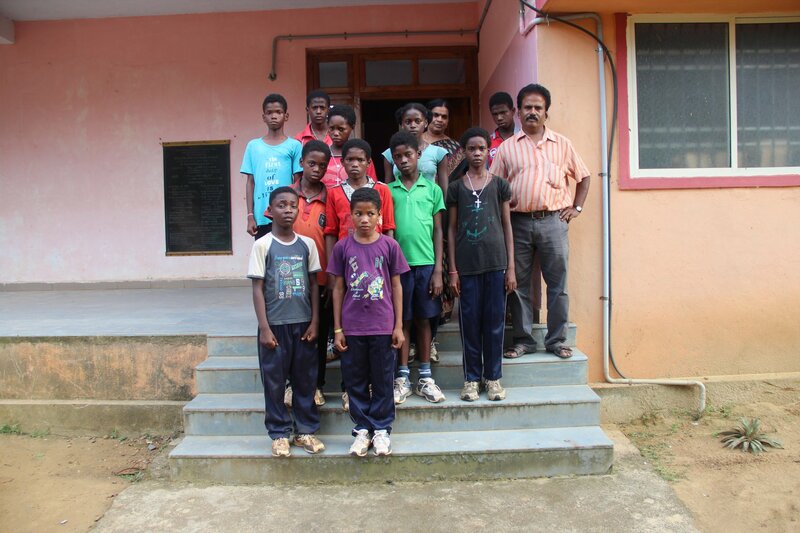 Sidi boys and girls staying at the Karnataka state sports academy at Karwar. They were shortlisted from a state-level pool of candidates and are undergoing training to be professional athletes. 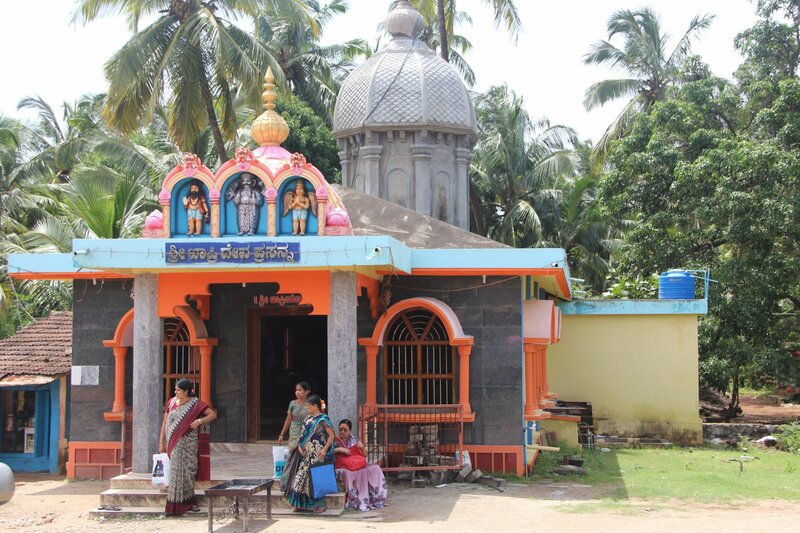 Majority of the small Sidi community in Karwar, Karnataka are practicing catholics. Most of the men and women serve in the different catholic establishments in Karwar. Sidi living inside the reserve forest at Manchikeri in Karnataka cultivate small patches of land near their home to earn a living. 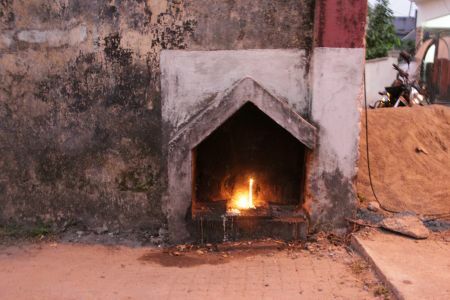 Loban or Frankincense, an aromatic resin with medicinal qualities burned during the Sidi ritual ceremonies. The ash is later collected and distributed to the devotees. 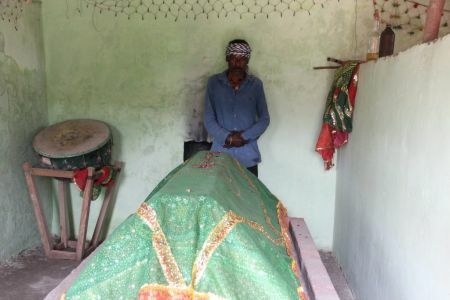 “Sidi Jhujhar” as he is remembered in the present, was a statesman and a general who served the last Sultan Shamsud-Din Muzaffar Shah III of the Gujarat Sultanate. 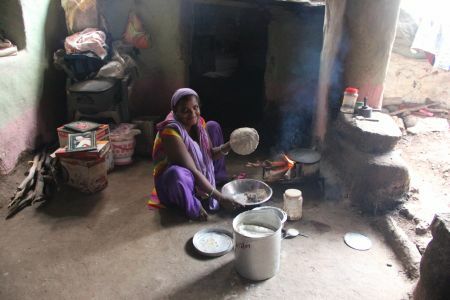 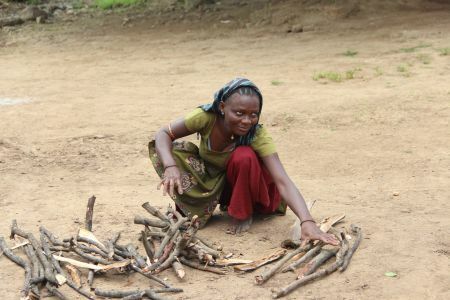 Most of the Sidi women living in interior Gujarat earn their livelihood by collecting firewood from the forest and selling them in local markets. 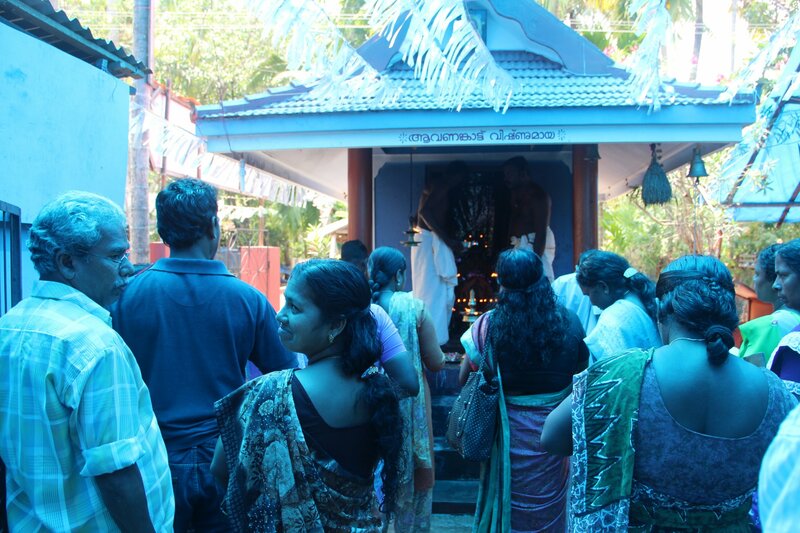 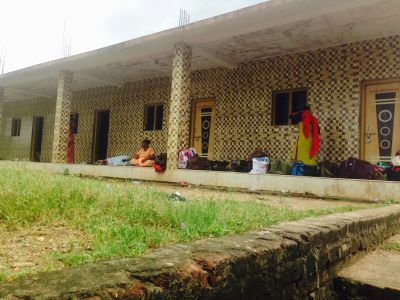 Devotees visiting the shrine of Bava Gor can in the restrooms adjacent to the shrines. People suffering from afflictions stay at these restrooms till they are cured. 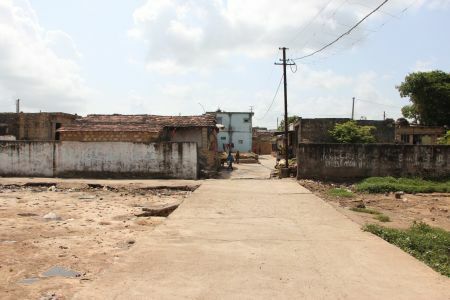 The small grocery store in the remote sidi village of Shirvan, Gujarat. 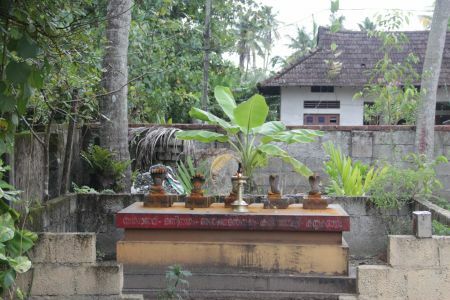 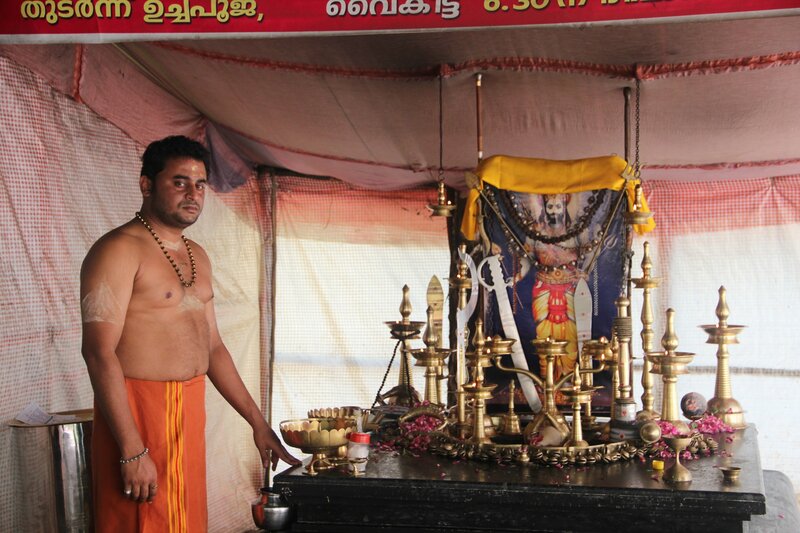 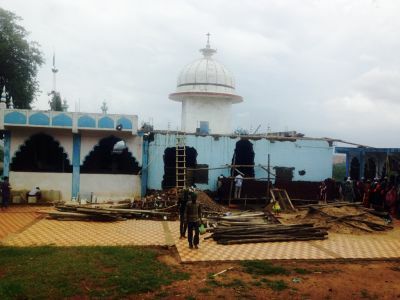 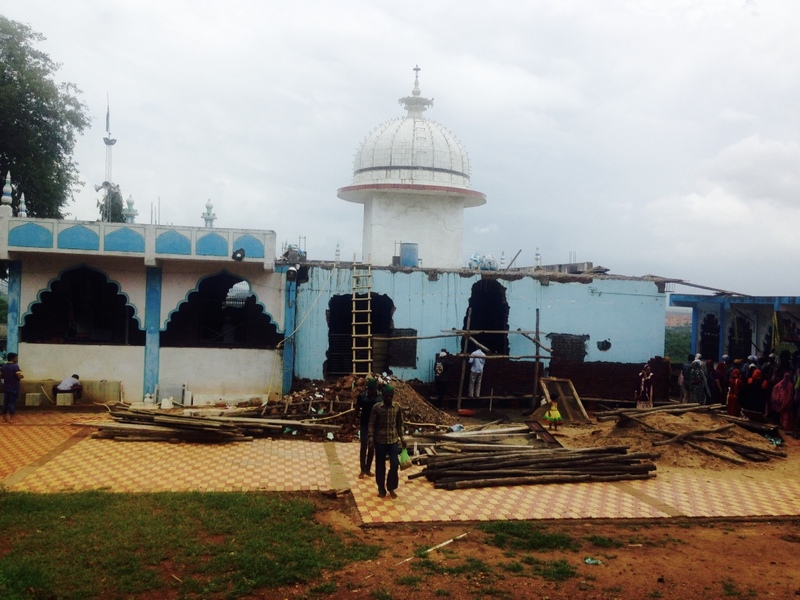 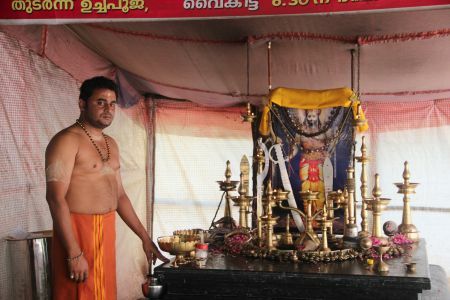 The central shrine dedicated to Bava Gor currently under restoration. 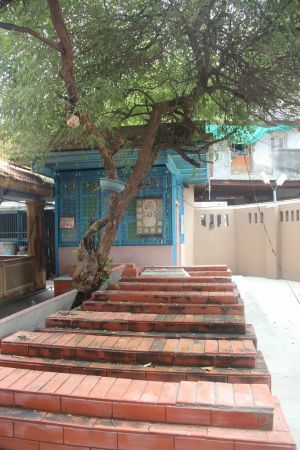 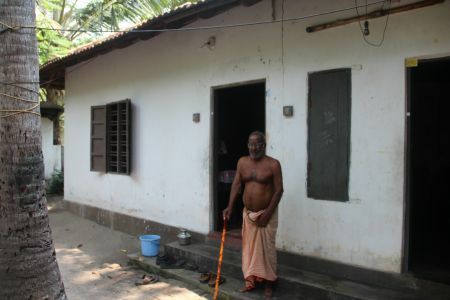 The entrance of the shrine dedicated to Bava Habash, younger brother of Bava Gor that is located on a neighboring hill. 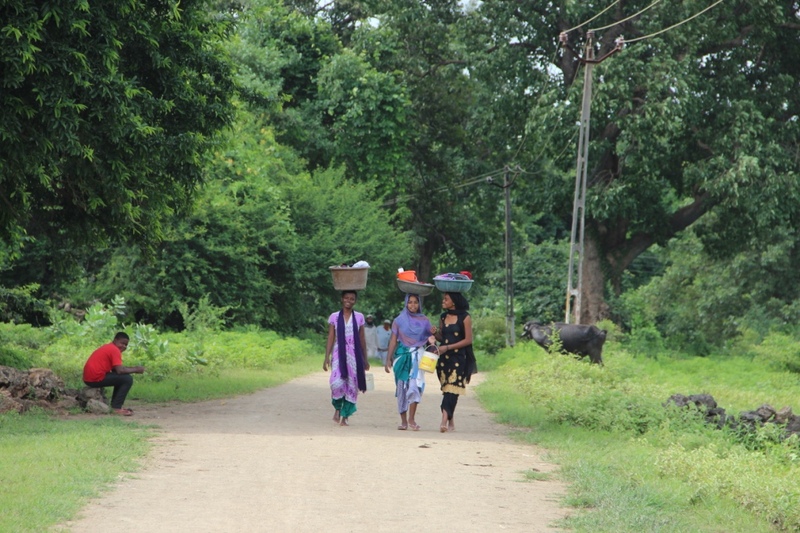 Sidi women walking to the river in Shrivan to wash their clothes. The river is the main source of water for the entire village situated in the Gir National Forest. 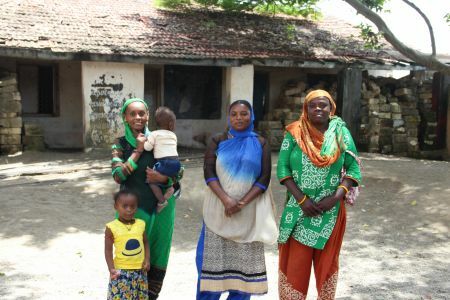 These Sidi women are part of the Gujarat Sidi welfare organization and they preside as the heads of the local district. Sidi Baba’s dargah at the Qutub Shah’s Mosque or Qutbuddin Masjid or the Patharwali Masjid. The arched entrance of the mosque. 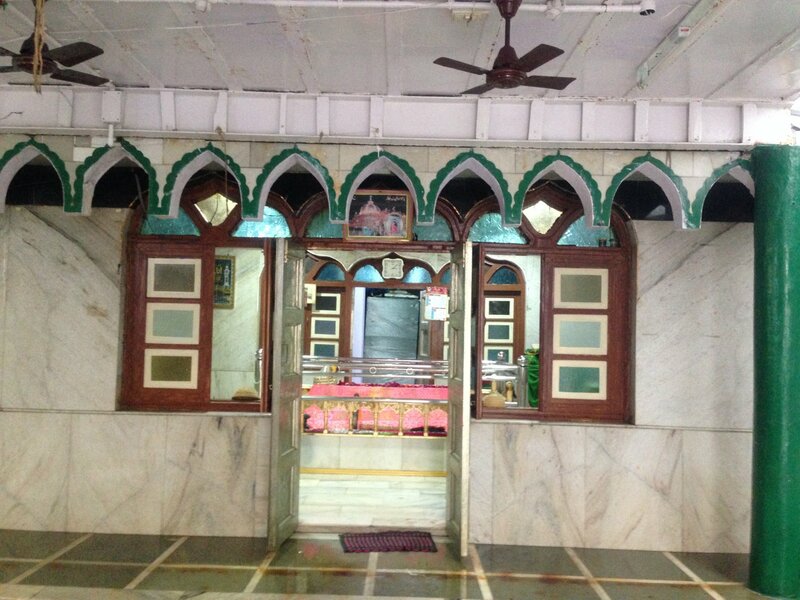 Seen here in the rear of the mosque is the carved window panels and the mihrab. 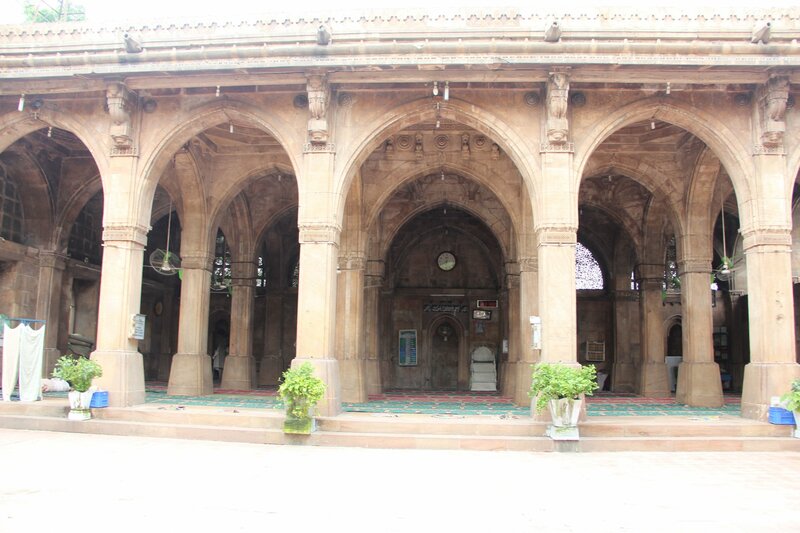 The only standing remnants of this beautiful mosque built in the mid-15th century are the two exquisitely carved minarets. 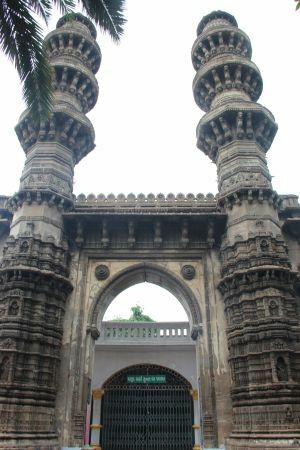 The structure of the mosque was destroyed in 18th century during the Maratha raid. 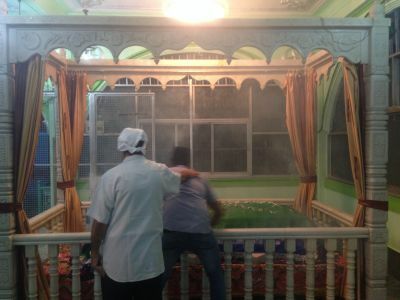 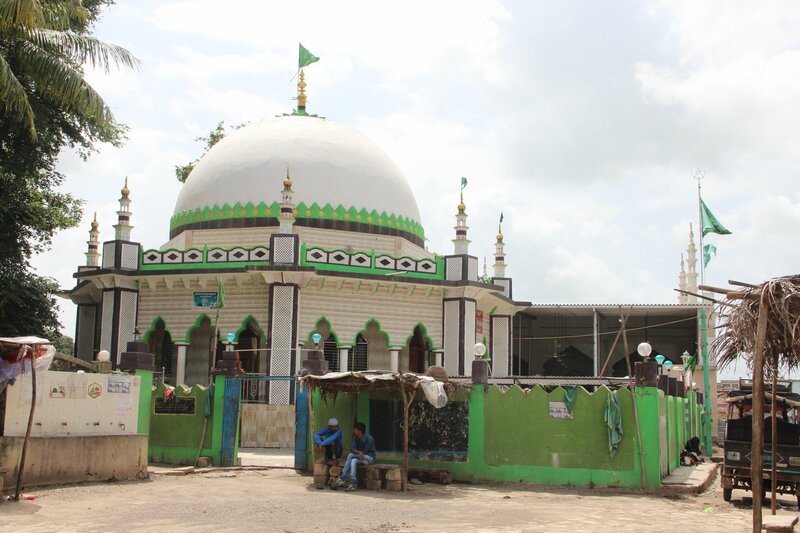 While it is not clear whether Sidi Bashir was the patron of the mosque, what can be argued is that he played a major role in the commissioning and construction of the mosque as his tomb is seen right outside the mosque. Seen here are sidi homes in the village of Shirvan, which is inside the Gir National Forest. 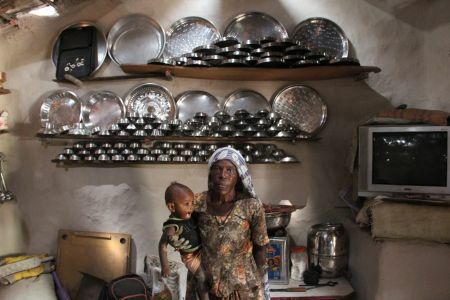 A sidi woman in front of her stainless steel utensils display in her home kitchen. 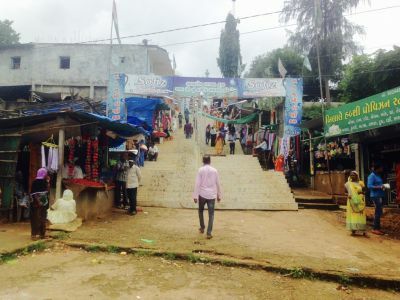 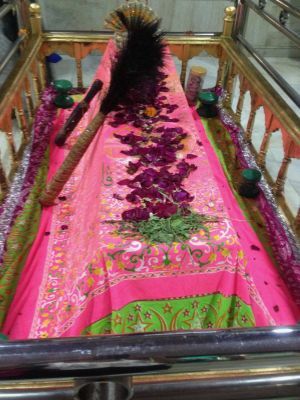 The shrine for Nagarchi Pir in the Jambur village is managed by the sidi community and the large shrine complex also has a chilla for Mai Misra. 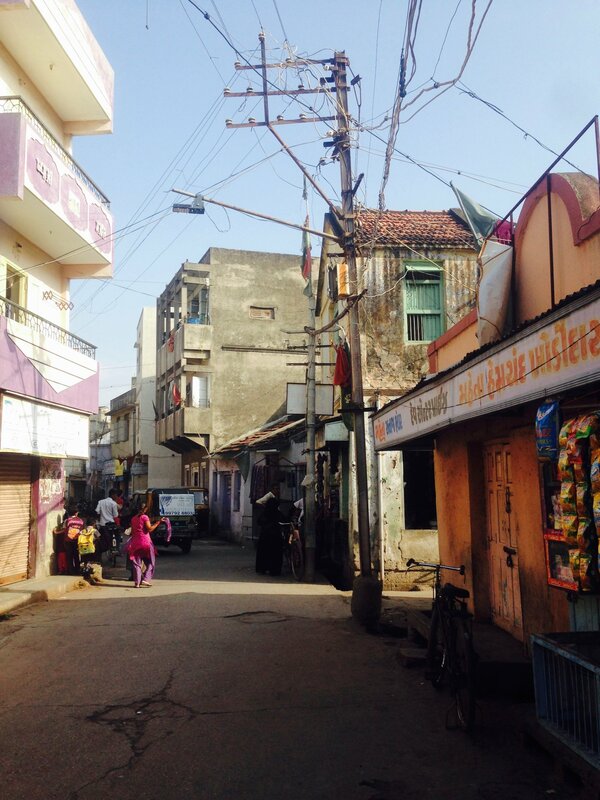 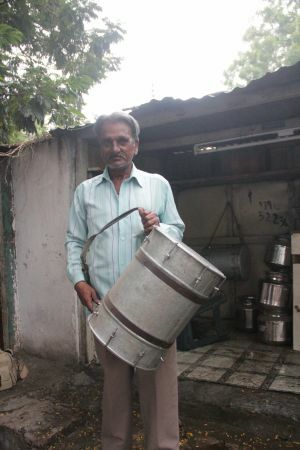 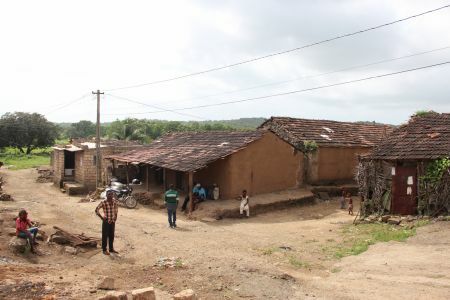 Jambur is one of the biggest sidi village in Gujarat and has around four hundred sidi households. 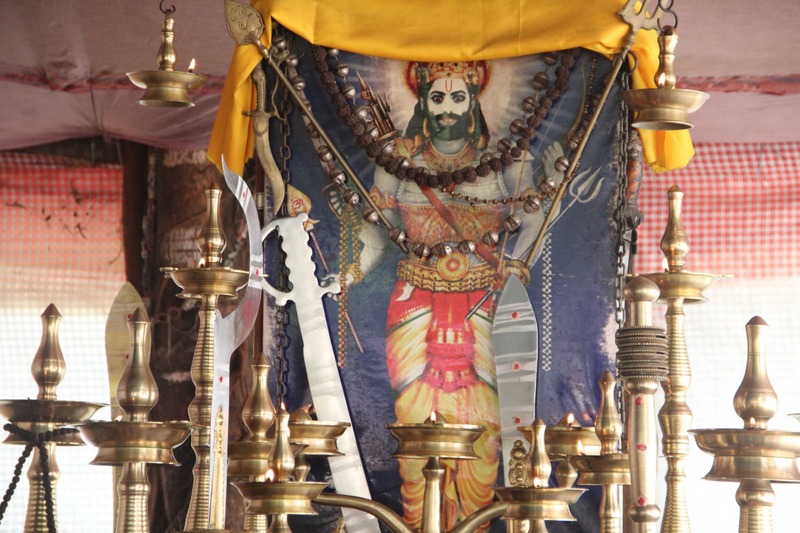 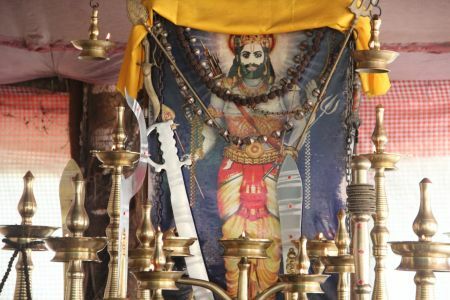 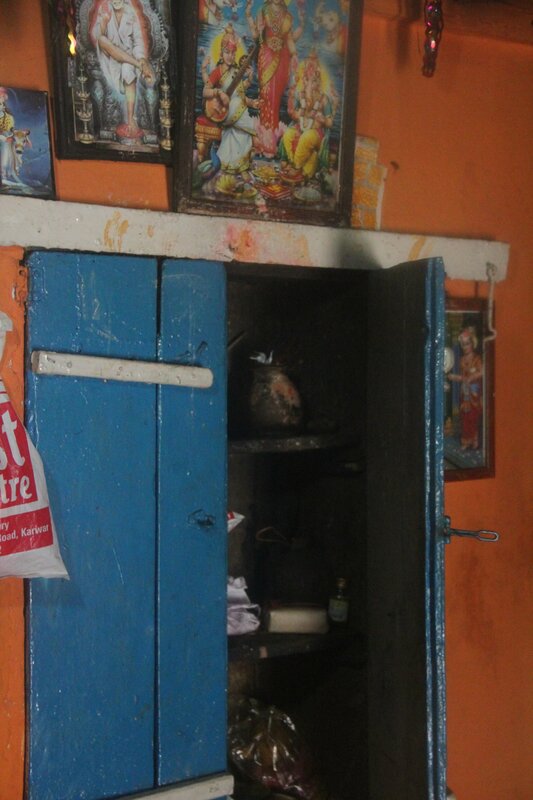 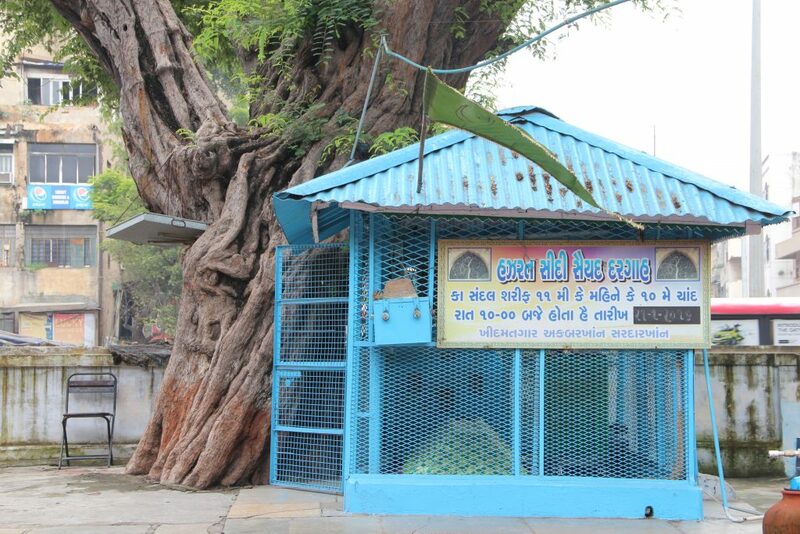 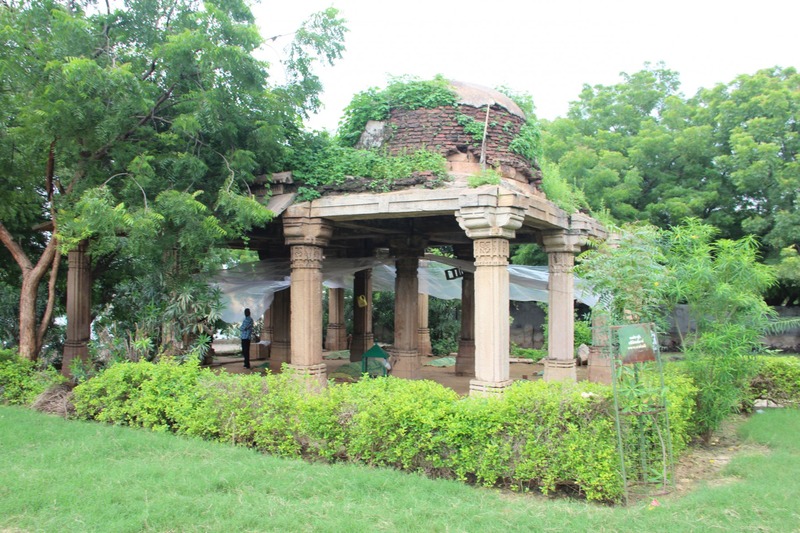 The locality adjoining the Shrine for Bava Gor in Jamnagar has been in the past home to several sidi families. 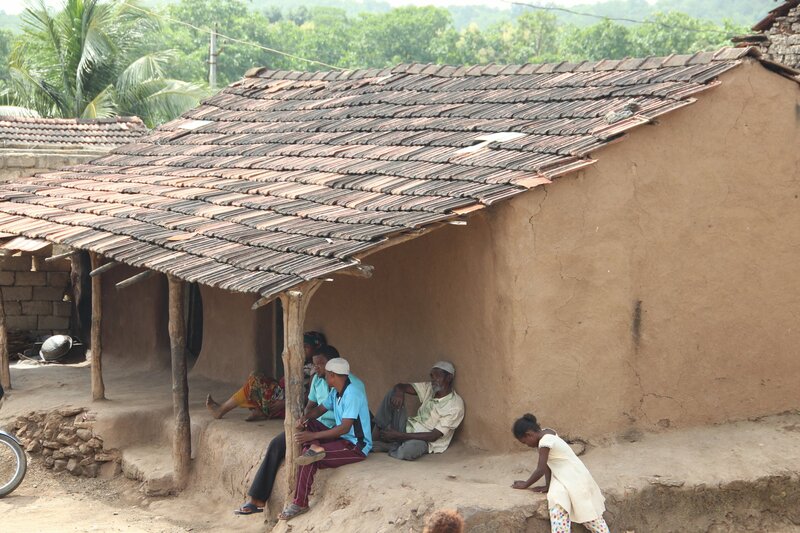 Most of the Sidis in the villages of Gujarat live in small mud row houses. Most of these houses do not have toilets or running water. 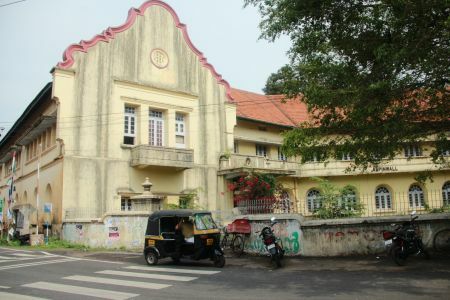 Aspinwall was the headquarters of a former British trading company and now this colonial building serves as the venue for the Kochi-Muziris Biennale, one of Asia’s biggest contemporary art festival. 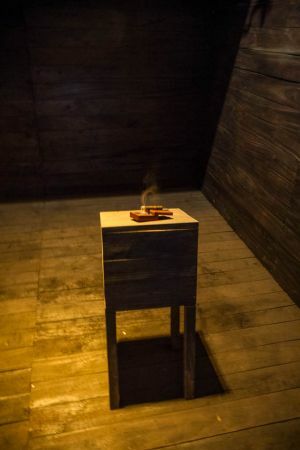 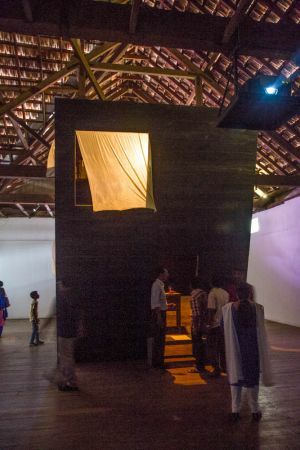 Dutch artist Gabriel Lester created this installation for the third edition of the Kochi-Muziris Biennale to tell the histories of the enslaved Africans in Cochin (Kochi). 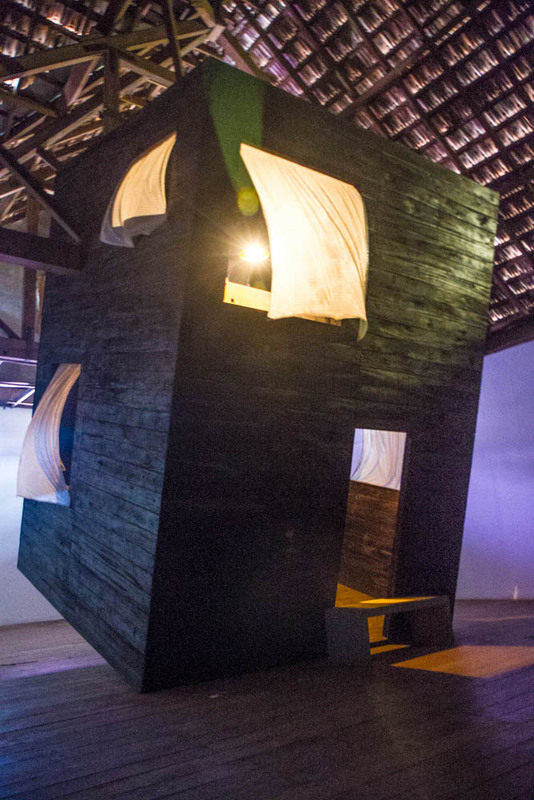 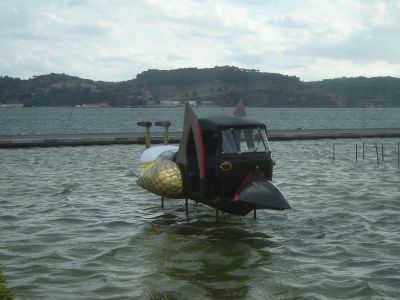 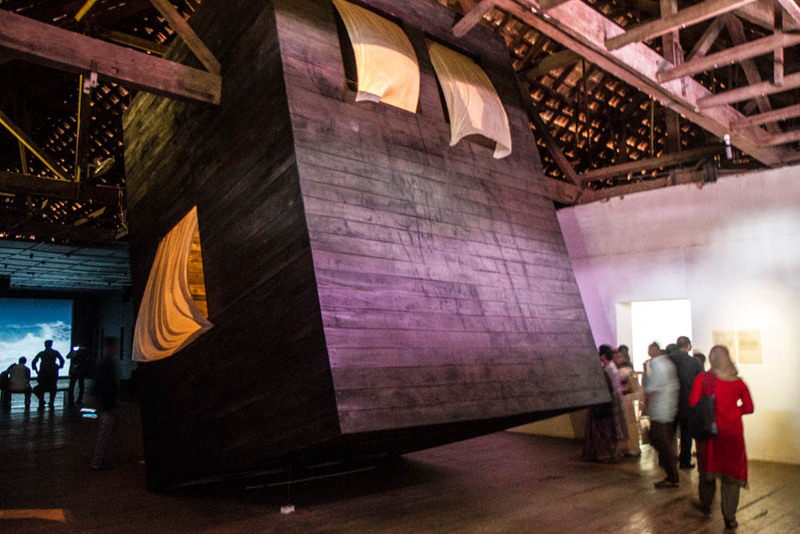 The sculptural installation of Kappiri created by Rigo 23 for the Kochi-Muziris Biennale 2012. 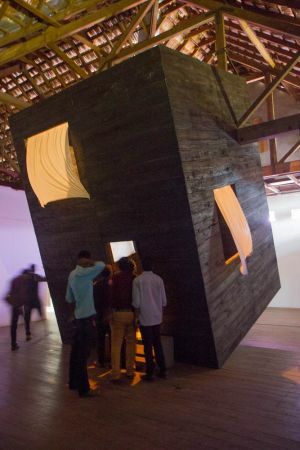 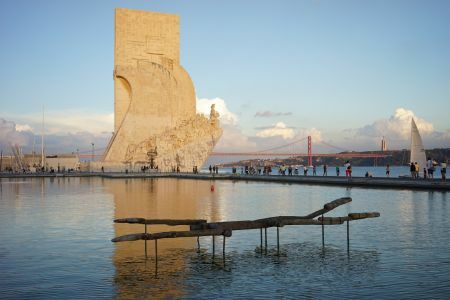 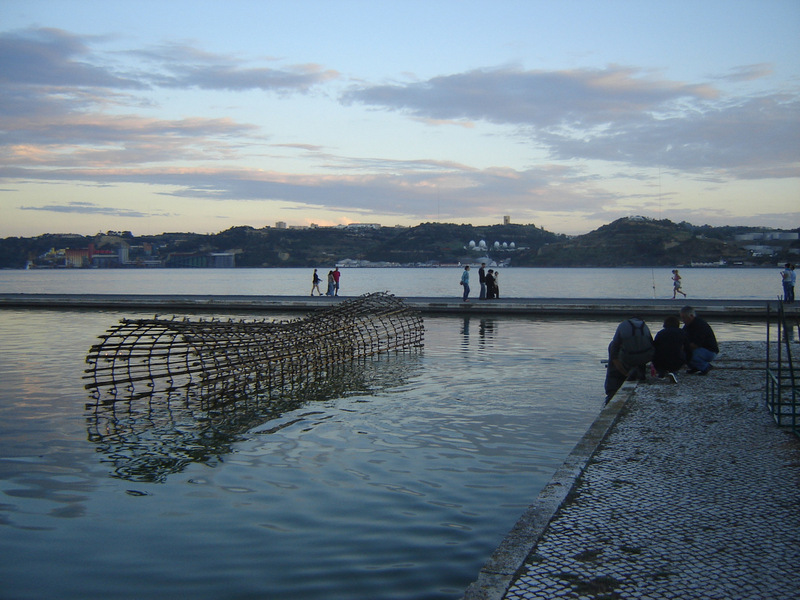 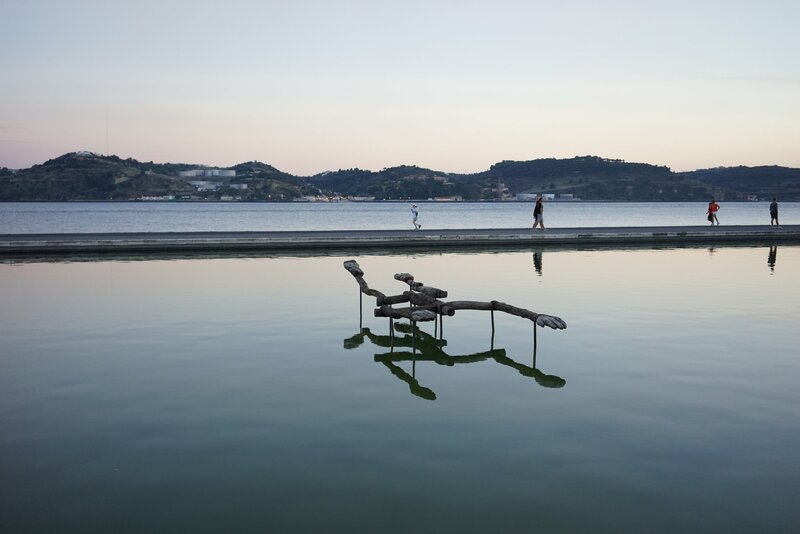 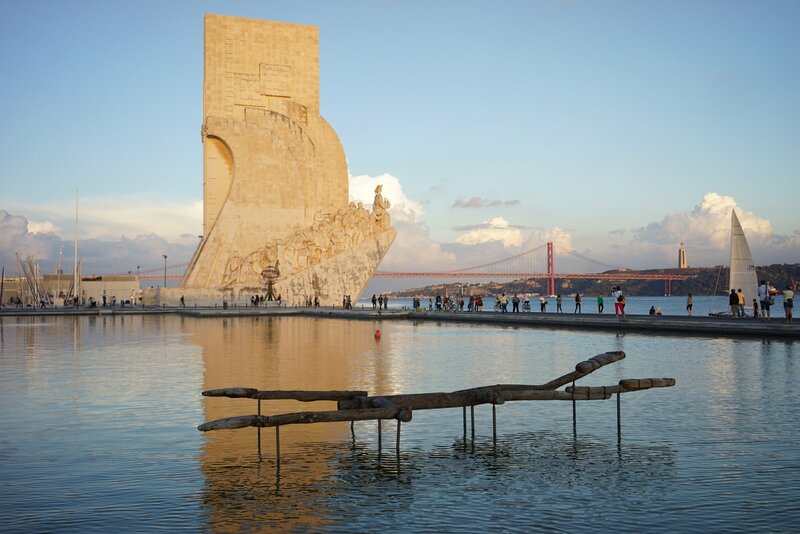 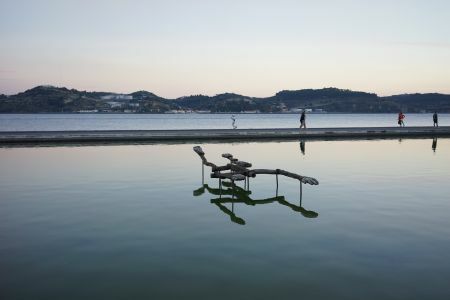 The suspended wooden sculpture narrates the treatment of Africans in Portuguese Cochin. 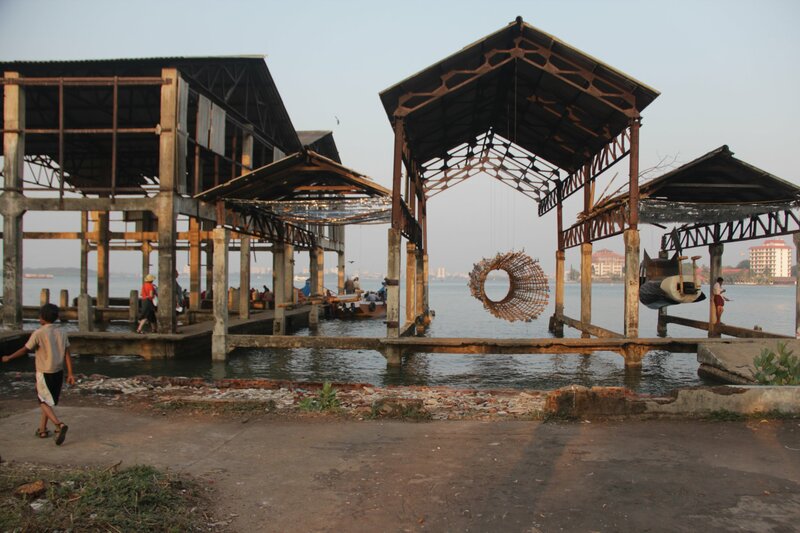 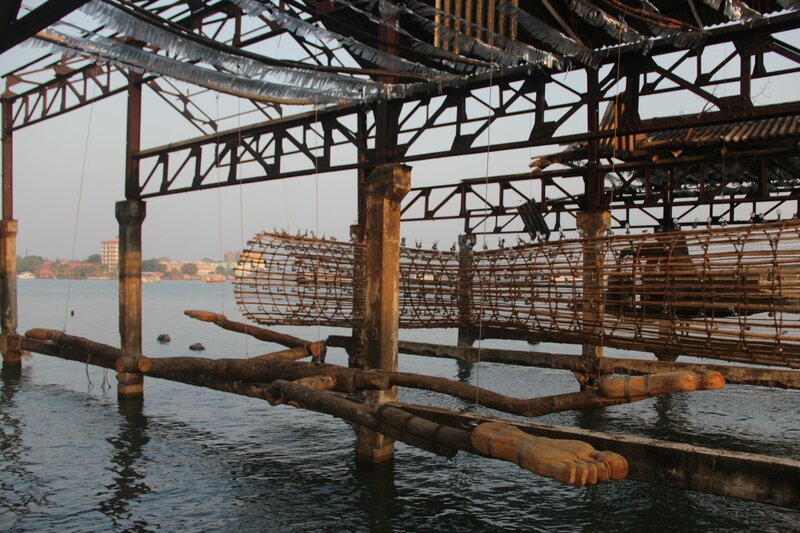 Portuguese artist Rigo 23’s tripartite installation Kochi Tower at an abandoned boat jetty in Fort Kochi. The installation presents the history of fraught African migration towards Kerala during the Portuguese period. 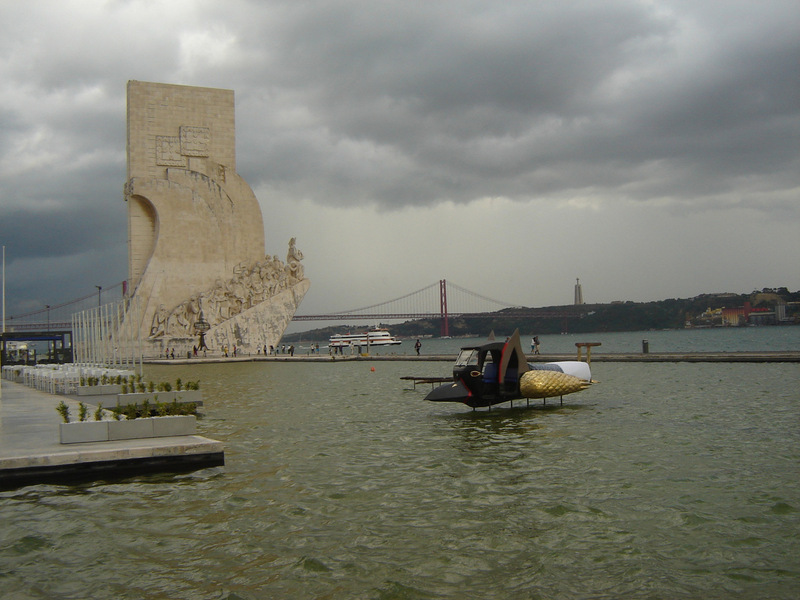 A converted auto rickshaw displayed represent the vessel of Vasco da Gama installed next to the tower that commemorates the Portuguese age of discoveries and expansion. 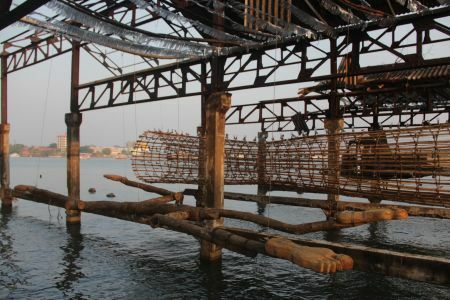 A hollow structure displayed to represent the Arab vessel Miri that was bombarded of the Calicut coast by the Portuguese to terrorize travelers and gain control of the Arabian Sea. 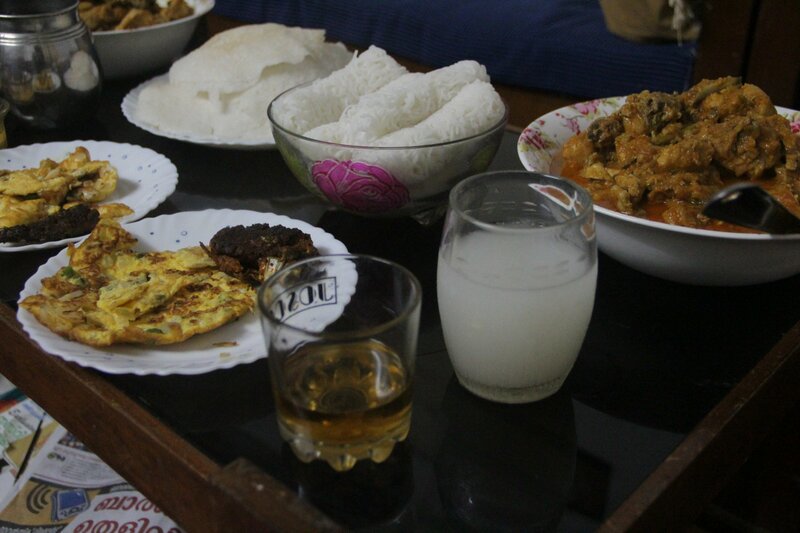 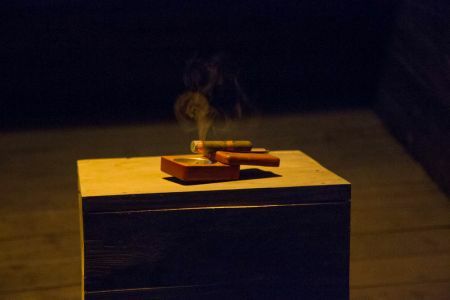 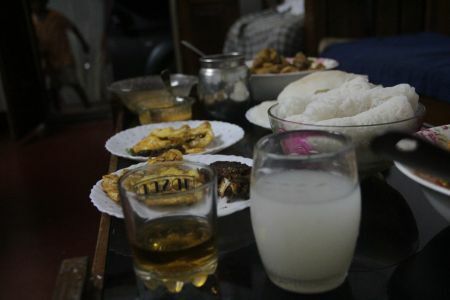 In Fort Kochi, cigars as often offered to the shrine of the deceased African to appease the afflicted spirit.